Transforming the way medical care is provided in the context of a serious illness or life-threatening situation requires changes in culture and norms within communities as well as healthcare systems, and practitioners. As consumers learn about the importance of preparing ahead of time for medical decision-making, they are more likely to bring care planning questions and concerns to their medical providers and have discussions with their loved ones. To celebrate National Healthcare Decisions Day we’re offering a 50-percent discount from now until April 16 at 11:59 PM PST on any of our advanced care planning courses, designed to help you effectively guide patients and families in this vital work! To get the discount, register today for any of the following courses using the promo code ADVANCECARESP. The Coalition for Compassionate Care of California in partnership with The California State University Institute for Palliative Care created Building Engagement with Advance Care Planning to promulgate strategies, methods, and tools to engage the public and healthcare organizations effectively in advance care planning. Applying health behavior change theory to advance care planning provides a framework for clarifying the goals of public education and engagement. As individuals move through a behavior continuum from initial unawareness of the need for action through steps leading to the desired action their motivation for participating in advance care planning evolves. Developing outreach and education strategies that align with the stages of precontemplation all the way through the action stage of completing an advance directive and/or discussing their care preferences. The course delves into these stages and describes strategies that best align with an individual’s willingness to engage. 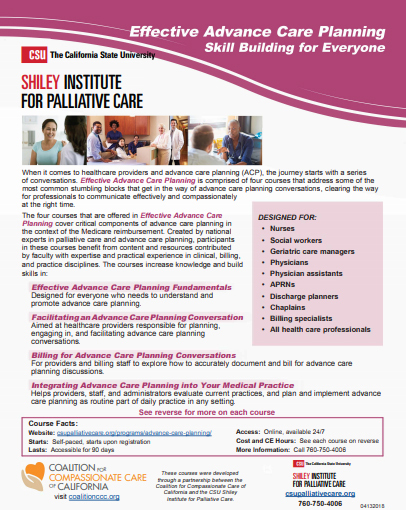 The course describes activities that organizations can employ to prompt community engagement with advance care planning. In order to transform the delivery of care to optimize advance care planning, organizations need reliable processes and systems including supportive leaders, policies and clinical protocols, documentation systems, staff training, patient and family education, and quality metrics. The course presents effective strategies to integrate advance care planning in a healthcare organization or system. Judy Thomas, JD: is the CEO of the Coalition for Compassionate Care of California (CCCC), and an attorney who has worked in healthcare for more than 20 years. Lael C. Duncan, MD: is a licensed California physician with more than 15 years of clinical practice in internal medicine, infectious disease, and long term acute care for patients with multi-system disease. Before joining the Coalition for Compassionate Care of California (CCCC) in 2014 as Medical Director of Consulting Services, Lael served the organization for four years as a passionate volunteer. Shirley Otis-Green, MSW, ACSW, OSW-C: is the Clinical Director of Consulting Services with the Coalition for Compassionate Care of California, a Research Consultant for the Psychosocial Oncology Specialization Program at the University of Louisville, Kent School of Social Work, and the founder of Collaborative Caring. Shirley serves on several editorial boards (including the Journal of Palliative Medicine) and professional boards (including the National Association of Social Work), is a Distinguished Social Work Practitioner in the National Academies of Practice, and is co-editor of the Oxford Textbook of Palliative Social Work.